Dancers, movers, jammers, come and experience how natural vision techniques can deepen your practice. Learn how where you place your attention affects your perceptions. Play with your awareness of space and of movement (your own and others). Accept invitations to experience relaxation and new ways of looking. Explore how your body habits and visual habits mirror each other. This is a structured practice with deep potential which uses vision as a way in, encouraging an integrated mind and body dynamic relaxation, which means.... it'll put you in the jamming zone! Doesn’t that sound really interesting? Get your place soon (details below)!! On Wednesday 20 April, we are hosting a special event to celebrate visual arts in Glasgow, as the International Festival takes place around the city. We welcome artists, movers, singers, musicians and curious people to a multidisciplinary improvisation space. Bring your materials and instruments. No previous experience is needed as you will be guided into the jam by Nina and Laura, who will introduce you to the form and invite you to move, draw and see individually, in duets and ensembles. The rest, is down to your creativity. Come and explore with us! You will find all the details below on our list of events. We are planning a very exciting event as part of the Global Underscore on Sunday 19 June. Save the date and keep your eye out for information on our next newsletter. By popular demand, we are welcoming the return of the gorgeous green @TGJ t-shirts. These will be available for a short time only so get your orders processed by emailing theglasgowjam@gmail.com while our stocks last. Only £15! The next jams are listed below and, if you need to plan more ahead, we have our full January–June programme on our website: http://theglasgowjam.blogspot.co.uk/p/jam-calendar.html). Lets jam together soon! There will be a 30mins warm up. Musicians come and play! 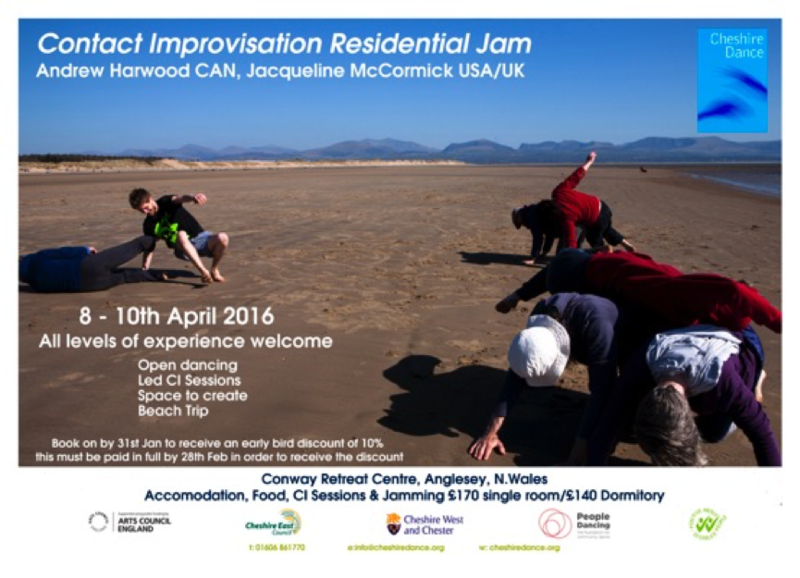 8 day long creative lab ending with a public performance, open to: dancers, movers, musicians and sound makers. Every day will start with the focus on physicality where the musicians will get the chance to move and the dancers will challenge their physical range through improvised tasks and set phrases - all with live music. Solène Weinachter and Jer Reid will explore many aspects of improvised music / dance. There is no 'and' in the title because our interest is in blurring the boundaries between music and dance. The music and the body will exist with an equal weight. To make a single event. We will explore the physicality of sound and the music inherent in movement and how both exist in the acoustic-spacial area of architecture. This is not at the expense of what is unique about the two creative areas. What is similar and what is different make an endless dialogue. 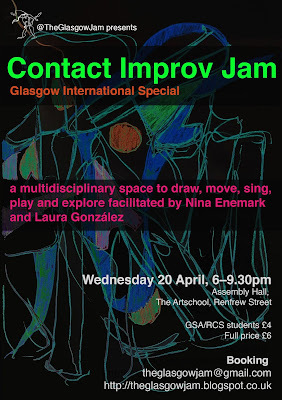 Areas to explore will include deep listening, fusing of dynamics that exist in both or either music and dance, physical tasks based on anatomic principles and instinctive impulses, and developing techniques for structuring improvising in performance. In this workshop, we will explore the many facets of suspension. In a physical sense we will focus on the suspension of our weight allowing a stretch of time as we float in the air for a moment longer. Also, our bodies, like all motor vehicles, are equipped with a system of shock absorbers, also know as suspension, allowing us to cushion the impact of our mass as we move safely in and out and across of the floor. On a subtler level, it may also refer to the postponement or temporary halt of a judgment, an impulse, a decision or an opinion as in suspending our disbelief. Through a dynamic physical collaboration of the senses we will follow our instincts and be guided by what is already in our body in order to access multiple facets of our innate creative wisdom. 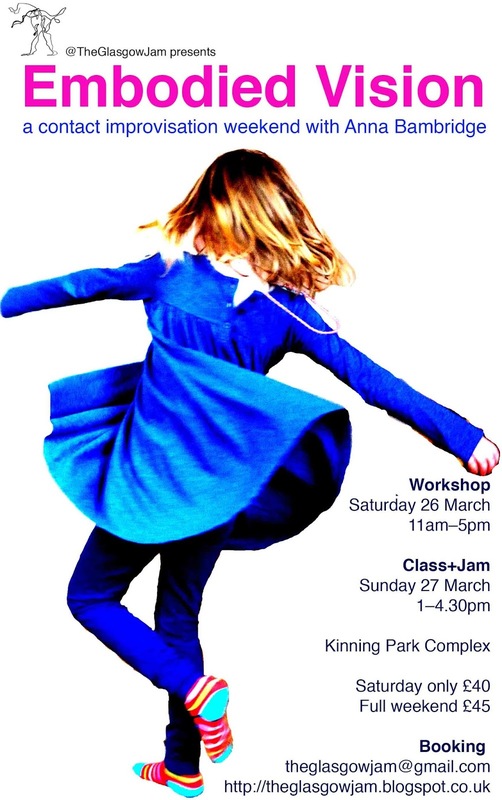 This workshop is hosted and administered by MovingEast in partnership with London Contact Improvisation and curated by Robert Anderson.